This year, more than 195 million people — over 60 percent of the U.S. population — lived in a community with a federal courtroom vacancy. This crisis affects all citizens because it creates a backlog of cases that undermines our system of justice and makes it difficult for most Americans to have their case heard in a timely manner. Our nation has 94 federal judicial districts (with at least one courthouse in each) that handle trial-level criminal and civil cases. The 13 U.S. federal appellate circuits generally handle intermediate appeals from the federal district courts and span several states. Currently, there are nearly 17,000 civil and criminal cases pending in Pennsylvania District Courts, and more than 2,000 cases pending in the Circuit Court. In 2014, the Western District of Pennsylvania had a backlog of 329 adult and juvenile immigration cases that languished, on average, for about 1.5 years, with an average adjudication time of 516 days. Pennsylvania has the second most judicial vacancies of any state in the country. 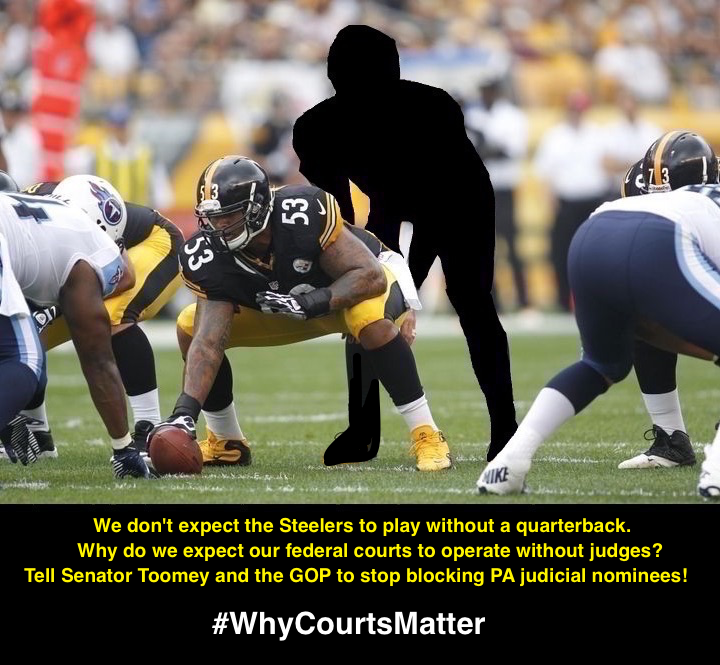 Every day that a seat on our nation’s federal court remains vacant, it is harder for ordinary Americans to have access to the courts. The numbers don’t lie; we are in the midst of a judicial vacancy crisis.